This global competition endeavours to encourage young people not to participate in the use of any form of artificial high whether it is, smoking, alcohol or drug abuse. Performance can give the high that is both healthy and rewarding. 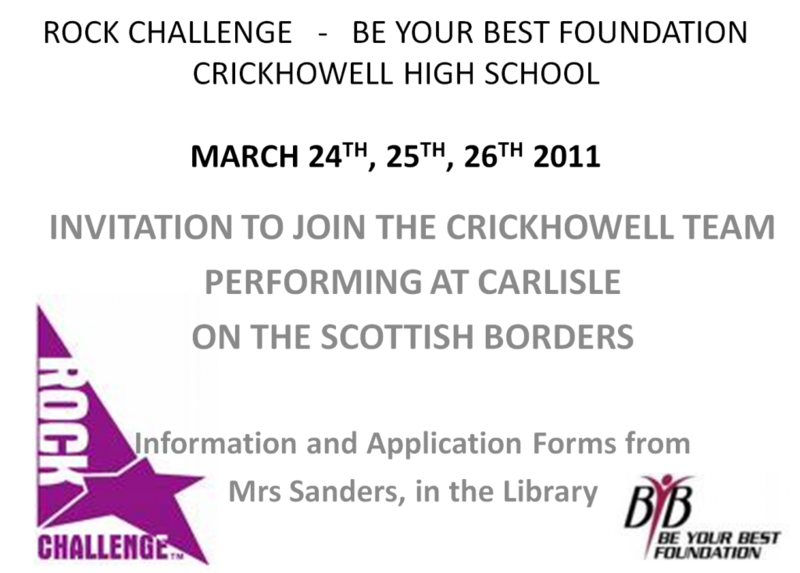 Crickhowell High School has entered this competition for twelve years. Winning the national competition and being placed in the finals six times. We have used many different stimuli for our pieces which have to be eight minutes in length being colourful, entertaining and giving a message concerning any of the Rock Challenge Criteria. The school was invited to represent the United Kingdom and to perform in Dubai in February 2008 because we have been seen to represent the global citizenship which is the ethos of the organisation. Further information can be seen on the Global Rock Challenge Web Site.